Before using OrthoGraph take your time to check the OrthoGraph 1st Steps Guide on Prezi.com and watch our best practices video tutorial! Buy OrthoGraph now to get the new features from the AppStore! 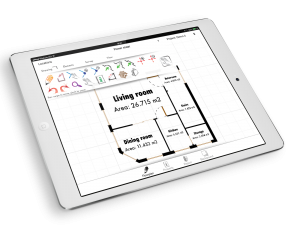 OrthoGraph is the only CAD application for the iPad that lets users sketch and then create a survey for the production of detailed floor plans with continuous graphic feedback on the fly. The unique approach of OrthoGraph is first to build up a hierarchical structure of building elements (land-plots, stories, rooms and room parts), and then each building element can be first drawn, just like using a pen and paper. Afterwards, linked to the survey you can adjust the walls and corners based on the measured data. This way creating a floor plan takes only few minutes, and the result is a complete building survey with, detailed reports on the rooms including calculated areas or window surface, etc. If there are difficult parts of the room, then you can add/remove or move any points of the particular room. Straight walls can also be bended and using the „Add housing” feature you can create a very good sketch of the room. In OrthoGraph the placement of the openings is also intuitive, you tap the wall where you would like to place a door or window, and swipe your finger to the direction it opens. When you release the screen, the opening is created. After this you can customize it. With the property tool you can open its property sheet, where you can select between 8 types of single door, 4 types of double door and 6 types of sliding and folding door and the empty wall opening. The window set is wide: besides the simple casement, you have double, hooper and fixed window, all in wood and plastic material. Changing the type is easy, chose the property tool, tap on the opening, and on the sheet tap the Type field. Now you can choose the desired one from the list. In the same sheet you have the field Direction, that lets you change the opening direction, if it is opening inwards or outwards, and if it matters also the left and right dimension. Additional to the width and position of doors and windows the system can store many more properties (parapet etc.) with them, even a photo can be made of the view of the window or the door. Moving a door or window within the wal can be done by measuring or simply select the door or window tool, tap on the opening and move it to the position you want. If only the size you want to change, than select the move corner tool, and move one endpoint of it. Please watch our related video. After sketching you can bend selected walls anytime. The bend walls tool in Drawing toolbar lets you drag a wall point and bend it as you want. The next tool in the toolbar lets you unbend if it is needed. Bent walls are circle segments, and as an addition to the endpoints you can also measure one of their inner points to make them exact. OrthoGraph handles besides the room polygon and doors/windows furniture too. The furniture library of OrthoGraph is supported as a predefined set by the current version of OrthoGraph. The object library contains chairs, tables, cabins and even a column to support all typical furnishing demands. The base object library is developed version-by-version of OrthoGraph Architect. It is important to mention that the object library is not just displaying the position of the particular objects, but can store many parameters. All object element has its own property set (depending on its type), and alphanumeric data can be stored with them simply opening their property sheets. We plan to have in the future this object library customizable by the user. This object library is project dependent meaning each project can have its library, so you will be able to measure office buildings and family houses using the same software and same device. OrthoGraph aproaches the building survey task in a very special way. The buildings to be measured are represented in a hierarchical structure of building parts like Building/Story/Office/Room. Each structural element has it own properties like a building can have an owner but a story has internal height as a parameter. Each property has a specific type like text, number, yes/no switch or even it can be of picture type. These information are always stored with the particular building parts like Office Room GE002 has its headroom of 3 meters (9.84 feet). OrthoGraph handles buildings with unlimited number of stories and rooms. One project can hold unlimited number of buildings that might be useful by large projects. Each building part has its own floor-plan. The rooms has to be drawn and measured one-by one, and then they can be attached to each other through wall opennings. This approach accelerates the building survey activities significantly even by large or difficult floor plans. OrthoGraph’s sketch recognition functionality is a unique and industry leading way of creating the floor plans. First by simply sketching the outline of a room onto the screen of the iPad OrthoGraph created straight lines with corners instantly. Then the particular room could be updated by measuring wall lengths and diagonals, OrthoGraph Architect kept all angles unmodified as long as it was possible by the entered data. To create a new room the user had to repeat these steps, but it is enough just to draw those new walls that are not common with the existing rooms, then by tapping inside the new room OrthoGraph snaps the sketched walls to their proper location. This way it might be enough only to measure these new walls and repeat the procedure to rapidly create the floor-plan. OrthoGraph can handle an unlimited number of projects. Projects are similar to files on desktop environments meaning you can store separate buidlings, floor plans and settings in each project. These projects can be uploaded as OrthoGraph drawing files (.srvd) to Dropbox and then processed further in CAD systems, or as JPG/PNG files. In many cases there are details which are important to survey or set as a parameter, or it is just needs to be displayed on the floorplan for better navigation or understanding. Labels are for this purpose, you can attach a label to any drawing part. You can draw lines with labels onto the floor plan like you would do it with pen and paper. All labels are connecting to the nearest drawing elements at their starting point, therefore any drawing change updates the label appearence too. You can format the label text as you want, color, font size and font type can be adjusted to your needs. Every OrthoGraph element has its property list. These properties are depending always on the type of the particular OrthoGraph drawing element. A wall has different properties than a room or a chair. Most of these graphical elements have a photo property that makes it possible to make a snapshot of a wall or a photo of the view that can be seen from a window. This additional information can help a lot by the post processing of the measured drawing even in the case it is used further as a 3D BIM model. In many cases there are existing floor-plans or at least floor-plan parts of a building to survey in blueprint or other paper format. In some situations point clouds are created of the buildings that can be used as background images to the floor-plan drawing created with OrthoGraph. There are many tools that can help using the existing floor-plan scans. Using the transparency setting scan-parts can very easily be moved and rotated to merge with each others. We have created a solution that allows not just importing scanned blueprints, but also precisely import flattened laser-scans of a building. Using these images you can simply tap and move all corners to their precise location, and the 3D BIM model can be easier created then ever before with any software system. Even in the case you want to use the point cloud in desktop CAD softwares like Autocad, Revit or ArchiCAD the fastest and simplest way is to convert them to usable drawing format is using OrthoGraph. Create notes, markings, descriptive drawings within your floor plan for later reference. There are two different brushes with 4 sizes and several colors for creating annotations. Annotations are always connected to the actual room you are working on, but when switching to 3D view, then all annotations will fly as they were drawn on the whole drawing. When the sketch is ready, then you can start with measuring the walls of the particular room. While you do the measurements, the floor-plan is instantly updated with all distances. OrthoGraph tries to keep the angles as they were originally sketched, but if the measurements make it necessary to change the angles too (e.g. measuring diagonals), then they will be also updated. There are rooms which due to their size or complexity faster surveyable with another method: the measure during sketch. This method is based on the surveyor going around the room, and measuring all wals alongside. OrthoGraph Architect lets the surveyor draw the outline wall-by-wall, and prompts for the length after each section. This means to tap the screen near to the end of the last corner and swipe it to the direction the new wall section goes. OrthoGraph helps the drawing by plotting the sketched wall to the nearest 15° and also by jumping to the end of the plotted wall in case it is streched out of the current screen-view. Hotspots are for registering and measuring any important points of the room. These hotspots have properties as most elements of OrthoGraph that can be stored with these important points. Besides just storing data hotpots give a great help in measuring corners that are hard to reach or hard to measure from the other corners of the room. Place down as many hotspots as you need, measure their position exactly from two corners of the room by each, and then you can use them to measure those corners, that could not be measured e.g. because there is a shelf or cabinet standing in the way. OrthoGraph handles buildings and the whole building survey workflow uniquely. The goal of introducing this new concept was to represent the real life workflow on the mobile device with the highest support the surveyor can have. The workflow in OrthoGraph starts always with creating the physical structure containing all rooms and spaces we want to include in the survey, and then entering into the particular room the survey begins. After this the surveyor looks around to understand the room, and then makes a sketch about it. When the sketch is done, then OrthoGraph Architect recognizes the sketch and creates a floor-plan representation of the room with walls. This floor plan can be edited, corners can be added/deleted or moved to ther proper location. The next step is measuring the required distances and entering them into the floor-plan, which updates the whole room to its real form. When a room is fully measured (all corners are surrounded with green circles) then we name it a „floating island”. This means that the room is ready by itself, but its placement is not fixed in the coordinate system yet. To fix it the newly measured room has to be assigned to a neighbouring room, which can be done through wall openings (doors or windows). When the two rooms are assigned to each other, then they will act together as one „Floating Island”. This group of rooms can be extended with the next room and repeatedly the whole floor plan can easily be created using this concept. Learn more on Prezi.com about this feature. OrthoGraph stores all measurements related to corner pairs, with the direction the user has specified the distance. This is important as the direction defines which points need to be moved if a related point is moved towards a direction. By creating an exact floor plan all points of it has to be surveyed from two others. OrthoGraph shows all unmeasured or partly measured corners with a red circle surrounding it, but if the point becomes measured (will depend on two other points) then it will be surrounded with a green circle. This way it is very easy to follow the measurement status of all corners and the whole drawing. Creating a building survey is a labor-intensive work traditionally, yet with many chances for error both on-site, both during post processing work. This can lead to improper results or costly additional site visits. Enhancing accuracy and faster survey can be achieved by using laser distance meters. The Leica Disto portfolio is the oldest such device family with 20 years of experience built-in. The newest model of the Disto line, the Leica Disto D510 (E7500i) has the capability to connect with the newer iPad models (the New iPad, iPad Mini and iPad 4) via Bluetooth, and OrthoGraph™ Architect – among the few first worldwide – can utilize this the same time the device is available in the market. (http://bit.ly/OGD510) The app – after establishing the Bluetooth connection – can receive the distances measured with the Disto automatically, creating the possibility for faster and more effective survey than ever. Watch this feature on YouTube! If you have another iPad or Leica model, you still have a solution facilitating a third party device, SerialIO BlueSnap SPP-KEY Bridge, which allows to connect the two hardware. OrthoGraph Architect can receive distances gathered with other Leica Disto Bluetooth capable laser distance meters like Disto D8, Disto D3aBT (D330i) or Disto A6 this way. For more details please check the related topic in our user’s forum, and watch the related videos on youtube: http://youtu.be/_KjWC95tfI0>, http://bit.ly/Ofutr1,http://bit.ly/UblIOE. We have got users from all around the world. We would like to support every user with local specific data entry so OrthoGraph is equipped with handling both the metric and foot-inch units with the same comfort. Every data entry field and report supports to measurement systems. 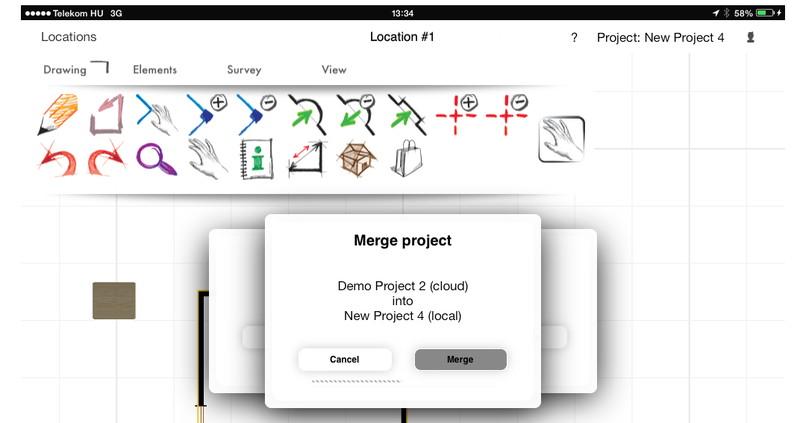 To any time switch between the measurement systems just simply set it in the settings pane of the iPad and from that moment based on the setting OrthoGraph will display all existing and new drawings using the requested measurement system. Creating floorplans is much faster and more precise if we us a laser distance meter, especially if we can connect it directly with the app. The new Bosch model GML 100 C is able to connect with the iPad, and we support it from the app. From version 8.2 you can send the measured distance to any field where you can collect distance. Using this report it is very simple to calculate how large area needs to be painted in a room, or how large is the flat that you are going to buy, renovate or clean. In many cases it is handy to know what the surrounding rooms are called for orientation purposes. In other situations when we have to present to a customer a floor-plan on the iPad and we need to give an overall view of the property, it is much more clear and gives a better overview if we can see the names and main parameters for all rooms. We at OrthoGraph recognized that we have users from many countries of the world. In the same way as there is a demand to support metric and foot-inch measurement systems, there is the same need to support local languages. In some case by professional translators in others by the help of our users we have implemented translations into OrthoGraph that is continuously extended with new languages. While creating a drawing, much information is stored into the floor plan. Each room’s floor plan, the objects they contain, much alphanumeric room and object properties and also we must not forget photos. All these information can be transferred to CAD applications which is very good, but what is with the end result? In many cases it is enough to have a detailed list of all rooms with floor plans, room properties, object list inside the room and object properties, images if there are. Now this is exactly what is a room book about. Everything you have drawn, measured and entered can be exported into PDF by a simple click, and then sent via e-mail or saved to Dropbox (in many cases these PDF roombooks can get really large). Don’t bother with sophisticated CAD applications is you don’t need the CAD result. Native DXF and IFC (2×3 format) output directly from the iPad New! DXF and IFC (2×3 format) are de-facto standards in the CAD world. We support these and many more. From version 8.0 OrthoGraph comes with an awesome new feature supporting two aspects of the professional work. First of all is the backup and restore function. From this version you can save your projects to OrthoGraph Cloud, and if you have Pro or Business subscription (free for the first month during the introduction period) all uploaded states of the projects will be stored automatically. These versions can be retrieved anytime giving you additional safety. The other great advancement of OrthoGraph Cloud Services is the support of teamwork. As a Pro customer you can share your uploaded projects (even old versions!) with other Pro customers, and then these files can be further developed independently. As a Business customer you get even more: the real collaboration with your colleagues. You can survey the same building the same time with a group of surveyors working on the same project / drawing. Collaboration means much more than just a simple upload and download procedure. Merge all your work with others’ works. This way you can be a part of a large survey task, and at the end all your work can be merged with the result parts made by others. The result when you finish: one integrated project. And all this with versioning! Business subscription is not just a higher level of cooperation, but it also offers a central user/license management, so you can purchase subscriptions for your colleagues, and give them multi-level permissions to the group of common folders what you create. You can save your projects to OrthoGraph Cloud, and if you have Pro or Business subscription (free for the first month during the introduction period) all uploaded states of the projects will be stored automatically. These versions can be retrieved anytime giving you additional safety. Merge surveys made by different surveyors or created at different times.